This contribution will provide a specification of a novel approach towards automation of distribution energy systems: EEPOS neighbourhood energy management platform. EEPOS is a research project funded under FP7 of the European Commission. First project results will be listed and discussed addressing management priorities, key services and functional capabilities. NEMS platform proposes a novel approach to distribution automation. It performs energy management in a semi-centralised way on two levels: building and neighbourhood. Building management allows maximizing the utilisation of fl exible demand resources in the neighbourhood since it has direct access to the controllable building appliances; whereas neighbourhood management provides effi cient utilisation of local DER and supports the local electricity grid. Thus, the neighbourhood management provides buildings with neighbourhood supportive management information, which is then applied in buildings in effi cient way. Such semi-centralised management combines benefi ts of centralised and decentralised systems. This may increase the feasibility of ‘smart’ grids. Dr. Arturs Purvins (European Distributed Energy Resources Laboratories (DERlab) e.V., Germany) was born in Riga in Latvia on the 28th August 1981. He obtained a Doctor’s degree in Engineering Sciences in Riga Technical University in 2008. From 2009 to 2012 he worked for the European Commission DG JRC Institute for Energy and Transport on assessment of techno-economic performance of Low Carbon energy technologies related to high Renewable Energy penetration challenges. 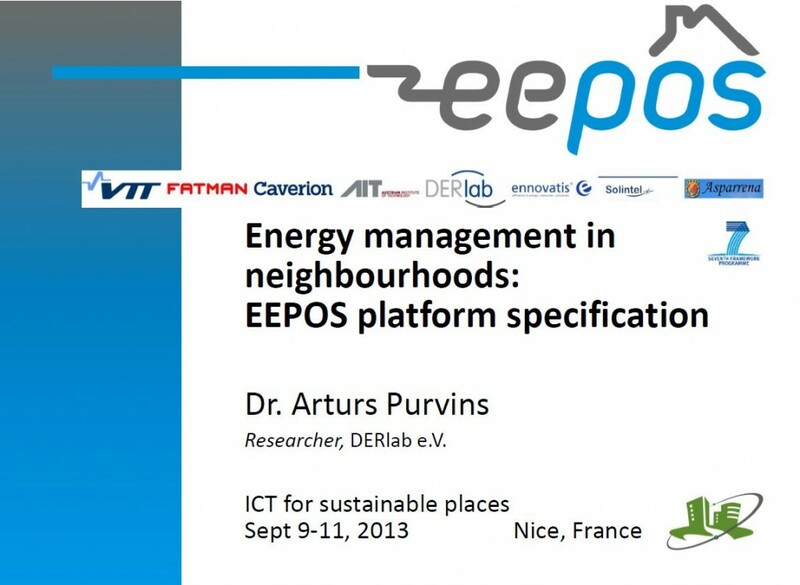 Since the beginning of 2013, A. Purvins is employed by DERlab performing research on energy management in buildings and neighbourhoods. His interests are in development of Energy Systems in distribution grids with high deployment of Renewable Energy Sources. The main instrument for performing these tasks will be load shifting within the neighbourhood. Following these tasks, the EEPOS management platform may reduce the overall electricity generation costs introducing neighbourhood load shifting services to the electricity market and in the neighbourhood grid. In other words, the aim of the NEMS is to provide a cost effective support to electricity systems with high deployment of DER. Building management systems perform direct management of controllable building appliances following recommendations from the neighbourhood management system. These recommendations are a product of neighbourhood management, which is performed focussing on the three aforementioned EEPOS platform tasks. Energy management functions such as high DER utilisation through load shifting etc. The contribution will conclude with possible application scenarios for the EEPOS neighbourhood energy management platform identifying business models and potential platform operators.